American meteorologist who followed Benjamin Franklin in employing kites in the exploration of high altitude air conditions. He was second director of the Blue Hill Meteorological Observatory. [p.739] THE recent improvements in kites have suggested perhaps to many the question, “How would Franklin perform his kite experiment to-day?” It may seem a little presumptuous to speak for that unique philosopher, and attempt to outline the modifications he would introduce were he to walk on earth again and fly kites as of yore; for, with the exception of Jefferson, perhaps his was the most far-seeing and ingenious mind of a remarkable age. But the world moves; and in making kites, as well as in devising electrometers and apparatus for measuring the electricity of the air, great advances have been made. 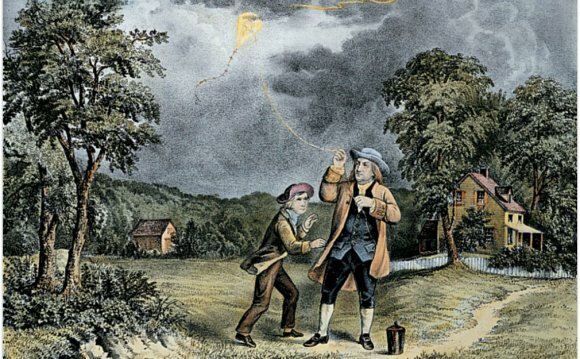 Franklin would enjoy repeating his kite experiment to-day, using modern apparatus. What changes and lines of investigation he would suggest are beyond conjecture. A hundred and fifty years ago a ragged colonial regiment drew up before the home of its philosopher-colonel and fired an ill-timed salute in his honor. A fragile electrical instrument was shaken from a shelf and shattered. Franklin doubtless appreciated the salute and regretted the accident. In the course of his long life he received other salutes, as when the French Academy [p.740] rose at his entrance; and he constructed and worked with other electrometers; but for us that first experience will always possess a peculiar interest. The kite and the electrometer betray the intention of the colonial scientist to explore the free air, and, reaching out from earth, study air electrification in situ. He made the beginning by identifying the lightning flash with the electricity developed by the frictional machine of that time. A hundred patient philosophers have carried on the work, improving methods and apparatus, until to-day we stand upon the threshold of a great electrical survey of the atmosphere. It is no idle prophecy to say that the twentieth century will witness wonderful achievements in measuring the potential of the lightning flash, in demonstrating the nature of the aurora, and in utilizing the electrical energy of the cloud. The improved kite and air-runner will be the agency through which these results will be accomplished. [p.741] Now, how would we perform this experiment to-day and with what results? Having flown big kites during thunderstorms, it may perhaps be best to describe step by step two of these experiments, and then speak of what we know can be done, but as yet has not been done. Our first repetition of Franklin's kite experiment was at Blue Hill Observatory, some ten miles southwest of Boston, one hundred and thirty-three years after its first trial. There were two large kites silk-covered and tin-foiled on the front face. These kites were of the ordinary hexagonal shape, for in 1885 Malay and Hargrave kites were all unknown to us. Fifteen hundred feet of strong hemp fish line were wrapped loosely with uncovered copper wire of the smallest diameter suitable, and this was brought into a window on the east side of the observatory, through rubber tubing and blocks of paraffin. Pieces of thoroughly clean plate glass were also used. Materials capable of giving a high insulation were not so easily had then as now. We knew very little about mica; and quartz fibers and Mascart insulators could not be obtained in the United States. Our electrometer, however, was a great improvement upon any previous type, and far removed from the simple pith-ball device used by Franklin. Knowing that an electrified body free to move between two other electrified bodies will always move from the higher to the lower potential, Lord Kelvin devised an instrument consisting of four metallic sections, symmetrically grouped around a common center and inclosing a flat free-swinging piece of aluminum called a needle. The end of the kite wire is connected with the needle and the sections or quadrants are alternately connected and then electrified, one set with a high positive potential, say five hundred volts, and the other with a corresponding negative value, say five hundred volts lower than the ground. Mascart Electrometer, with Photographic Register, July, 1892. Perhaps the most noteworthy result of these earlier experiments was the discovery (for such we think it was) that showery or thunderstorm weather was not the only condition giving marked electrical effects. The electrometer needle would be violently [p.742] deflected and large sparks obtained at other times. Day after day as we flew the kite we found this high electrification of the air, and we had no trouble in getting sparks even when the sky was cloudless. One other discovery was made, and this would have delighted Franklin more than the other, for he was always most pleased when a practical application was in sight. Seated within the instrument room of the observatory, with his back to the open window through which came the kite wire carefully insulated, and the kite high in air, the observer closely watching the index of the electrometer could tell positively, and as quickly as one outside watching the kite, whether it rose or fell. When the kite rose, up went the voltage, and vice versa. In other words, the electric potential of the air increased with elevation. It must be confessed that the kites made today would have behaved better and flown with more steadiness than the one we used. It may have been the varying wind, or more likely wrong proportions in the kite and tail; but our old hexagonal kite [p.743] would dive even when high in air. Once we kept the kite aloft from the forenoon until late at night, but that was something unusual. Electrical Potential of the Air.